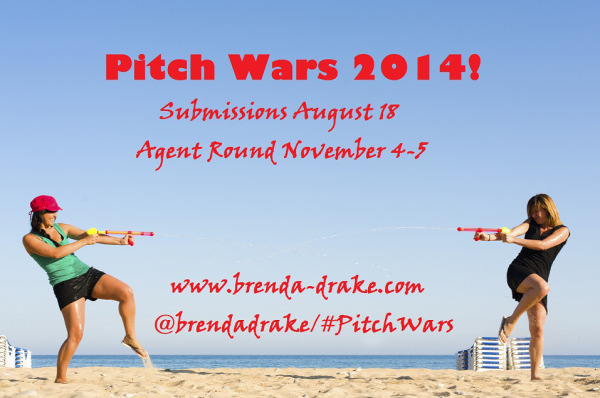 In case you’re wondering, PITCH WARS is a super cool contest hosted by the fabulous Brenda Drake. And, of course, it’s a writing contest. What else would I post? And what’s seriously special about this contest is writers will be selected for mentoring. That’s right, winners will get help polishing their ENTIRE manuscript to get it ready for the agent round. Today Brenda posted the awesome lineup of agents that will be participating from agencies such as The Bent Agency, Dystel & Goderich, Sarah Jane Freymann, Park Literary, Writers House, Andrea Brown Literary, and—and more! So go check them out here. The submission window is fast approaching…August 18th, 2014 to be exact. Get your fingers flying on those keyboards and finish that novel to submit. I know you can do it! Hi, my husband knocked on ur door the other day for Mediacom internet services and you gave him your blog details. Nice to meet you on here, I also live in JC and I’m enrolled in Creative Writing at present online. Thanks for ur link about Pitchwars and PitchMAS, I’ve been inspired to write my own story. Well hello neighbor! It’s always great to find a fellow writer from my own town. You’ll find the writing community is extremely supportive of one another, constantantly offering free tips. If you have any questions, just let me know. I’m also on twitter @pdpabst. Good luck with classes and writing your novel!